It’s all about shifting your mindset from selling equipment to selling service. If you hope to change any result in your life, you have to do something different. Maybe that’s common sense, but I’ve seen so many contractors over the years who just keep their heads down and plow ahead doing the same things over and over… and then complain that their results haven’t improved. To truly change your results, you need to do a 180 and do something completely different. And to do that in our business, you need to sell services first. That requires that you change your mindset and mirror the contractors who have been wildly successful selling services first instead of focusing on equipment. Here are the top five qualities shared by all of the super-successful producers using our Total Immersion Program. Embrace these attitudes and qualities – and you’ll be well on your way to changing your business for the better. 1.They position themselves as different and unique. 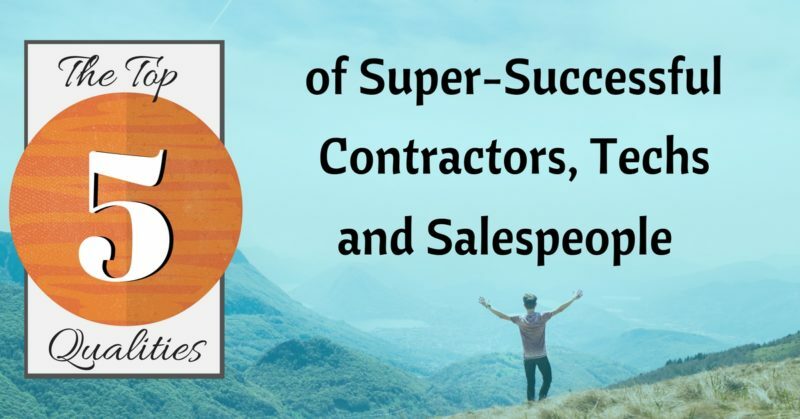 The super-successful contractors, techs, and salespeople are myopically focused on differentiating themselves from their run-of-the-mill, commodity-selling competitors. They position themselves as totally unique, offering a completely different service experience and a far wider array of benefits than everyone else in their market – because they understand that the secret to competing in an overcrowded market is NOT competing at all. By positioning their services as something totally different from everything else being offered in their market (different in strategy, diagnosis, presentation, and in the actual experience they deliver to clients), they’re able to rise above the bloody commodity-selling price war that all their competitors are tangled up in. As a result, they’re not limited by what they can charge since they’re not easily compared to other contractors, and their customer retention rates are sky-high, since what they offer can’t be experienced anywhere else. 2. They expect and have become accustomed to success. Because the super-successful have seen that the correct strategy leads to close rates that are twice that of the average contractor, and invoices that can literally be triple or even quadruple the industry average, they operate with an expectation of success. Since nobody has offered the customers in their markets anything like what they offer, demand for their services rises, and jobs come to them in droves. While their competitors are getting “no’s” and “think-it-overs” on 60% of their quotes, the super-successful enjoy closing rates up to 75%. While their competitors struggle to hit the $500 mark on a repair or $3,500 on an installation, these super-successful contractors, techs, and salespeople can and do see average service calls in the $1,500 range and installs averaging over $10,000. 3. They are tenaciously honest and realistic. The super-successful don’t chase bad deals and bad matches. They don’t fudge or sugar-coat. When a customer isn’t telling them what they need to know to do their jobs well, they keep digging until they find out everything. They hang in there, they don’t accept excuses from their customer or from themselves. 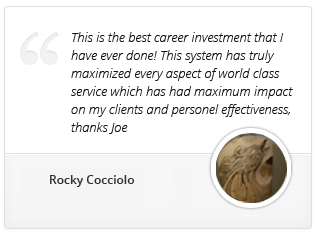 Their complete honesty earns them high credibility with both their customers and their bosses. When it’s clear that the sale isn’t going anywhere or that a customer isn’t a match for their company, they’re honest about it – with themselves, their customers, and their bosses. They know it’s better to disqualify a “wrong” customer and let the customer (and their company) move on to find a better match. 4. They always sell services – never equipment. Those who consistently succeed offer their customers the finest service available anywhere. They’re more than happy to let their competitors further commoditize themselves by focusing on parts and equipment. The super-successful talk about what they’re going to DO for their customers, and see parts and equipment only as the secondary “stuff” that allows them to provide their world-class service. They know the key to their success has nothing to do with parts or brand names. They know that THEY are the real brand their customers are buying, and the difference the customer will be more than happy to pay for. 5. They present only when their chances for a positive result are high. Through the proper questioning and pre-qualification techniques that we teach in Total Immersion, high earning contractors, techs, and salespeople meet with their customers and present their solutions only when the time and environment is right to bring about a positive result. They don’t ask their customers to make important decisions unless they’re in a position to choose wisely. This includes the customer being ready to make a decision and having all parties involved in making the decision available. This assures that the company’s time, the tech or salesperson’s time, and most importantly the customers time are all respected and not wasted at a time when a decision can’t be made. Those who produce on a high level and enjoy much higher than average incomes aren’t smarter than you. They weren’t born with a special set of skills or talents that the rest of the world doesn’t have. They’re just hard-working people who have adopted a proven process for providing world-class service, making MUCH more sales, and getting top dollar for their efforts. If you’re still selling parts and equipment in today’s marketplace, you’re trying to fight a nuclear war armed with a sharp stick. The industry has changed, and unless you commit to changing, odds are you’re just going to continue to get more of what you’re getting today. Now, if you’re enjoying huge margins, making all the money you want, and your business is growing like crazy… that’s awesome! Good for you. Keep doing what you’re doing. But if you’re not, I want to encourage you to take a serious look at our Total Immersion Program. This comprehensive business-building and sales program has literally transformed hundreds of businesses since its inception. How do you emphasize services instead of parts and products in your market? What questions do you have about the Total Immersion Program? Let’s chat about it in the comments section. Contact me with information about pricing, etc.